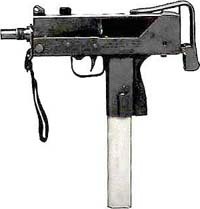 The Mac-10 resembles the Israel made Uzi but is actually an entirely different gun. In Counter-Strike, it is only available to the Terrorist team. It has an extremely rapid rate of fire but to compensate, it's much weaker than most automatic weapons found in Counter-Strike. The Mac-10 does well at very close range but quickly beyond that it starts to become ineffective. As with many other weapons found in Counter-Strike, the Mac-10 just doesn't seem like an intelligent buy when comparing price vs effectiveness. I'd only recommend this gun if you're fooling around in a public game, but definitley choose something else for match play.